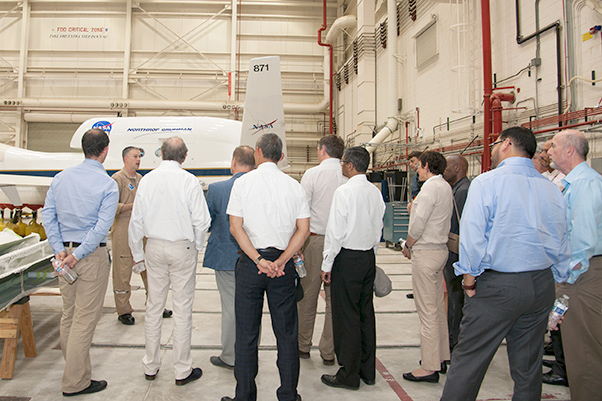 Armstrong personnel describe to visitors that NASA uses the Global Hawk autonomous aircraft for research missions such as hurricane research. 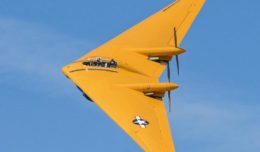 NASA’s Unmanned Aircraft Systems Integration in the National Airspace System, or UAS in the NAS, project is attracting international attention as increasingly complex flight tests take place over NASA’s Armstrong Flight Research Center in California. Two events at Armstrong June 29 and July 13 gave industry, the Federal Aviation Administration and international entities updates about how that work — which is meant to enable UAS to gain routine access to the NAS where commercial aircraft fly — is progressing. To do so, the project is working with industry, academia and other government agencies to develop recommendations for the FAA to safely open the skies to allow UAS to fly in the same airspace with human-piloted aircraft and enable new economic opportunities. “The technical focus of the UAS Integration in the NAS project is on detecting and avoiding other aircraft, command and control of the aircraft and human factors such as how to arrange the displays to maximize the pilot’s ability to make decisions,” said Robert Sakahara, Armstrong’s acting UAS Integration in the NAS project manager. Using NASA’s remotely piloted Ikhana aircraft as a demonstration platform, attendees to the July 13 event viewed on a screen what the aircraft’s ground cockpit instrumentation looked like during a flight test. One of the Ikhana displays showed the surrounding airspace as it flew. When its airspace was broached by another airplane, the cockpit displays presented the Ikhana pilot with alerts and information about how to respond to the intruder. The flight was one in a series of flight tests at Armstrong that began in June and is continuing into August. During that test, the Ikhana dealt with 21 intruder encounters, each one different from the others. 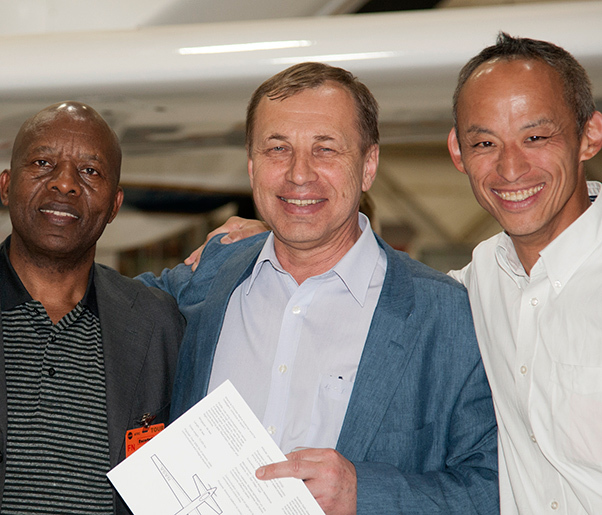 International Civil Aviation Organization air navigation commissioners Kabbs Twijuke (Uganda) and Alexander Korsakov (Russia) and ICAO air navigation commissioner president Hajime Yoshimura were among the special guests who recently visited Armstrong. Flight tests still to come will generate information that will be helpful in developing UAS-related standards for use with a new Airborne Collision Avoidance System that will support the FAA’s Next Generation Transportation System. Earlier, on June 29, the UAS in the NAS project hosted commissioners from the International Civil Aviation Organization. “Our focus was on the research we perform to support development of regulations that will allow routine access for UAS in the NAS without the need for FAA Certificates of Authorization (COA), or special routes to conduct missions,” said Laurie Grindle, acting deputy director of programs. ICAO is the International Civil Aviation Organization that is a United Nations agency established in 1949 to consider and recommend international rules, such as those that will govern UAS and is another rulemaking organization that NASA research supports. The ICAO contingent represented the highest ranking technical body in the organization. 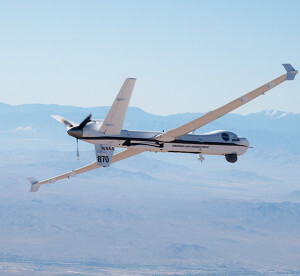 The Ikhana remotely piloted aircraft flies a research mission. “We wanted the ICAO commissioners to return with better understanding that it’s not just sending commands up to a large UAV and it does what you want. It’s more difficult and there’s a lot more to that,” Sakahara said. The briefings focused on NASA and Armstrong research that contributes to domestic regulation development. Also attending were members of the RTCA, a nonprofit organization that serves as a federal advisory committee that works with industry, government agencies and academia based on requests from the FAA. 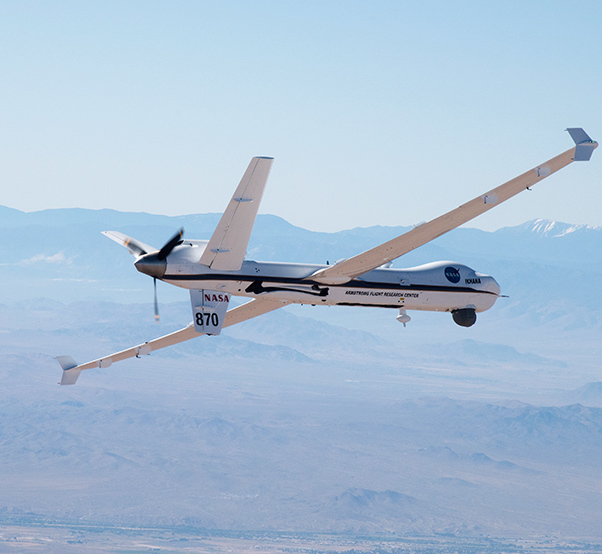 A lot of work remains to meet NASA’s goals for the UAS Integration in the NAS project that is ongoing at Armstrong and NASA centers: Ames Research Center in California, Glenn Research Center in Ohio and Langley Research Center in Virginia. However, with NASA, industry and academia working together to provide information to assist the FAA in regulations to safely integrate UAS in the NAS that day is getting closer.